I decided this summer to move beyond using wild edibles in salad and medicine to experiment with cooking weeds. 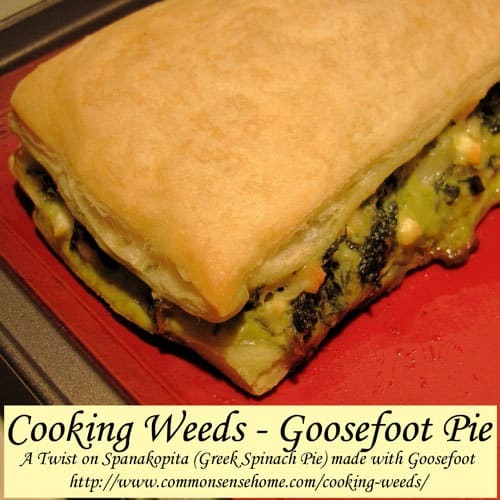 Goosefoot, also known as lamb's quarters, was a taste and texture very similar to spinach, so I decided to use it in a version of a a Greek spinach pie (Spanakopita). Our vast colonies of milkweed plants are loaded with blooms and milkweed seed pods, so I decided to give those a try as well. My sister was visiting, so I knew she would be brave enough to eat some with me. 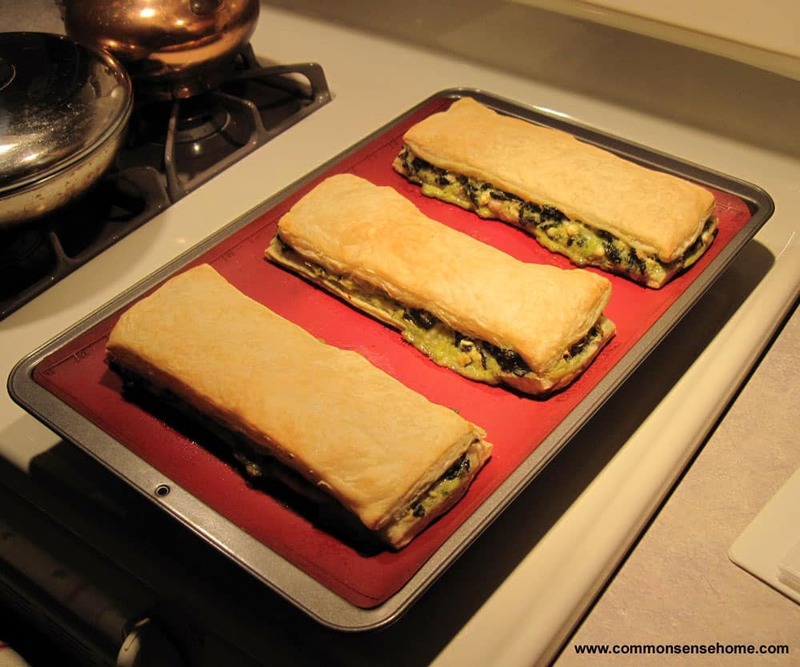 *Note: When I used Pepperidge Farm puff pastry sheets, I found that the dough layers were already pretreated with an oil blend and did not require brushing with additional butter/olive oil before baking. When I used Athens brand, it was a more traditional phyllo dough, containing thin dry sheets of pastry that required the application of butter/olive oil before baking. If you are using traditional phyllo (pastry sheets without oil or butter), you will need an additional 1/4 cup of melted butter and 1/4 cup of olive oil. The oil and butter is mixed together and brushed onto each layer of the pastry sheets before baking. 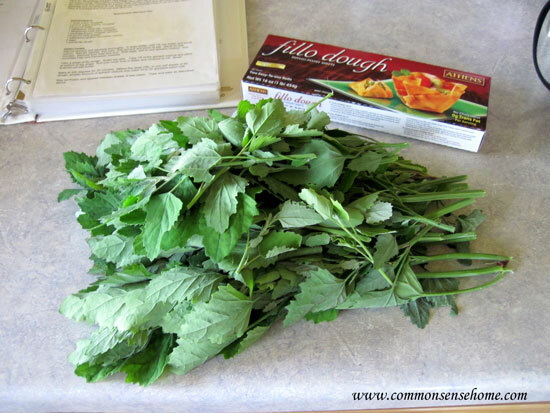 For cooking, you want to select young, tender goosefoot that has not started blooming or going to seed. Harvest the top growth. If you prune back to a side branch, you will likely get multiple flushes of fresh growth from one plant. I've got a few in my corn patch that I keep growing just for this purpose. This was the goosefoot (lamb's quarters) I used to make one batch of pie. In a large skillet, melt 1/2 cup butter and saute onions until translucent. While onion is cooking, wash the goosefoot thoroughly and chop into roughly one inch square pieces, removing any really tough stems. There's no need to be exact – just make sure you can stuff them into your mouth easily and they are roughly the same size so they cook evenly. 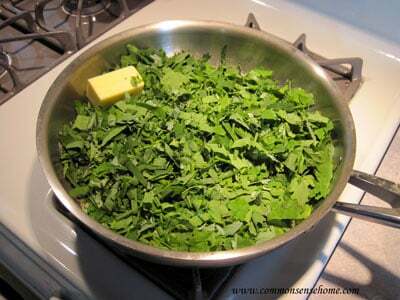 Add the goosefoot and salt to pan with the butter. Cook until tender. Add dill, parsley and mint. Cook for a few more minutes. Remove from heat and cool slightly. In a medium bowl, beat eggs, mix in crumbled or finely diced feta cheese and Parmesan cheese. Add to spinach mixture. Preheat oven to 350F. Thaw dough per package directions. The Pepperidge Farm type was easier to work with when it was only partially thawed, as it got soft and sticky when completely thawed. The Athens type needed to be completely thawed. Cover one sheet with waxed paper and a damp cloth while working with the other. To use the Pepperidge Farm phyllo sheets, I simply place one on the pan, spread the goosefoot mixture evenly over over the top, then placed the second sheet of phyllo on top of the goosefoot mixture. 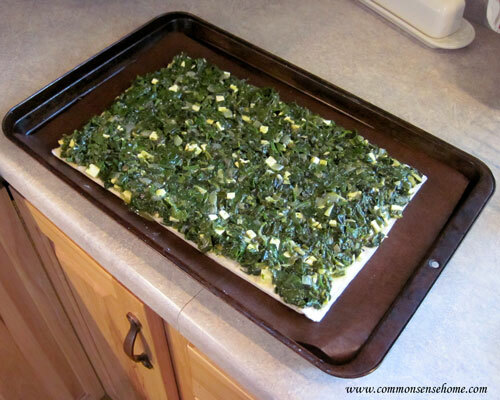 With traditional phyllo, each sheet should be brushed with a mix of butter and olive oil before assembling. Here's the pie, waiting for the top set of phyllo sheets. To ensure even cooking, I cut the assembled pie width-wise into three uniform sections. Bake at 350 degrees F for around 25 to 30 minutes, until golden brown. The boys really liked this dish, so much that they asked me to make it again – soon. So far I have made it three times with good results. The flavor of the goosefoot is affected by heat, as I noticed that the last batch (prepared after a week of 90+ temps) was stronger in flavor than previous batches, although still good. Lamb's quarters is high in calcium, vitamin A and B vitamins. It is also high in oxalic acid, so those that are sensitive should be aware of this. If you like, you can make a simple yogurt sauce to go with the pie. I enjoyed it, the boys just wolfed theirs down plain. Mix all ingredients together in a small bowl. Best if chilled for one hour before serving. I remembered reading in The Forager's Harvest that almost all parts of the common milkweed plant are edible, and we have a TON of milkweed this year. There are huge patches of it all over the property. I checked to see when the pods should be harvested, and noted that the author recommended those that were roughly 1 inch in length. Bingo! While I was out on a morning walk with my sister, we each tried a small raw pod. They tasted something like green beans, so we decided to cook some up for breakfast. We picked about a pint of pods in a range of sizes from around 1/2 inch to 1 1/2 inches long. Your hands will get sticky while picking – really sticky. I found that rubbing my hands down with a bit of oil before washing helped clean off the sap much faster. Rinse the pods thoroughly and make sure to knock off any hitchhikers, clinging blossoms or other debris. Heat a medium to large frying pan and add a bit of butter, bacon drippings or coconut oil. Add pods. Cook until tender, stirring regularly. You may add a little minced garlic if you like, and some salt and pepper. Add a little more fat as needed, or a bit more water. The pods will absorb quite a bit of fat/liquid – like little sponges. Serve warm. 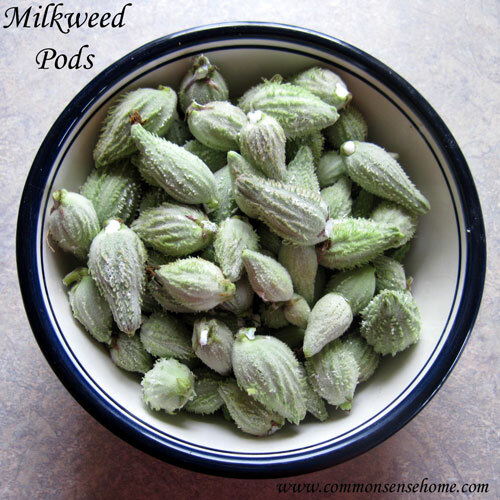 How did the milkweed pods taste? As a mentioned earlier, the raw pods tasted like green beans. The cooked pods tasted more like a combination of green beans and asparagus – that is, most of them did. Samuel Thayer swears up and down in The Forager's Harvest that he has never encountered bitter milkweed. Indeed, he goes on at some length about the subject. We were not so lucky. Some of the pods were crazy bitter – just plain awful. there was no way to tell when you were going to get a bitter one – not by size or appearance. I suspect it was due to our recent dry spell and extremely hot weather. Just as cucumbers get bitter when stressed by heat and lack of water, so I believe do milkweed pods. For future harvests, I may resort to taking a knife with while harvesting and taking a small taste of each pod before collecting. On the plus side, after eating the bitter milkweed pods, the homemade waffles with fuzzy navel jam taste even more awesome than normal. So out of two weed cooking attempts, we had one excellent result and one so-so result. I'll keep experimenting and share what we find out, and you're welcome to share or add a link to your favorite way to eat wild harvested foods. Don't forget to share or Pin if you like the post. Excellent! I’ve only eaten lambs quarter boiled down like spinach. I do that a few times in the Spring. I leave a few to grow to maturity; to shade our desert garden a bit, and my hens like the leaves too. Sure takes alot of them to amount to much in a recipe though! Thanks for sharing your foraging tips and recipes! 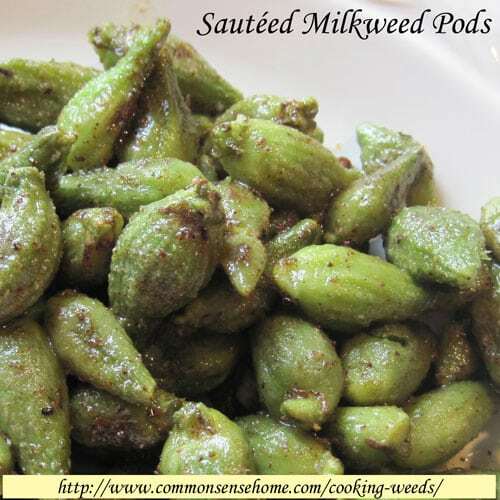 Its the first time I’ve heard of eating the milkweed pods, grew up picking and eating the top cluster of leaves before they pod out so have something new to try. Thank You! You’re welcome. The ones that were not bitter were quite tasty.